Meet Tyson, a handsome American Staffordshire Terrier Bulldog Mix. He is around 40 pounds and 8 months old. 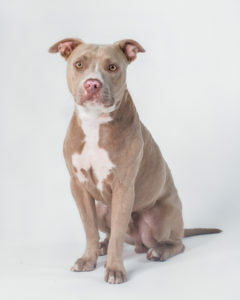 Tyson was rescued by True Love Animal Rescue SF from a backyard enclosed crate, abandoned by his owners. Tyson has just completed his two week board and train to adopt program and he now has all the fundamentals of basic obedience. Tyson is an active dog full of energy and eager to please. He is very a affectionate boy, showering everyone he meets with kisses. Tyson gets along great with other dogs but at times gets carried away and has a tendency to mount. Small dog parties with tolerant even tempered dogs would be more suitable for Tyson than a dog park.